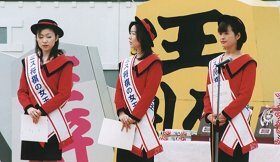 At the event place on the top of Mt.Maizuru, they hold a presentation ceremony of "Miss Koma no Jyoou" (Miss Tendo) every time. This year they selected 3 women below. After the presentation, the main event "Ningen Shogi" will start. They have performed Japanese traditional drums as a presentation of traditional works still now. But this year they performed to cheer up both troops. 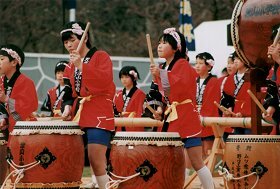 At first the students of "Tsuyama" elementary school performed "Ryujin Daiko" for the red troops. "Ryujin" means the dragon in Japanese. 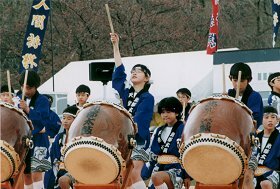 "Ryujin Daiko" by Tsuyama elem. "Hokubu Daiko" by hokubu elem. Next time the students of "Hokubu" elementary school performed "Hokubu Daiko" for the blue troops. That title "Hokuto no Hibiki" means the sound of the Big Dipper. 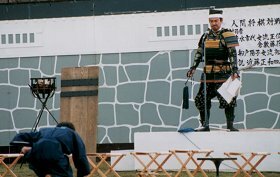 After the performance of Japanese traditional drums, a messenger run toward a general of the blue troops. He told him that the red troops finished to prepare the battle. This is a new stage direction, too. Their performance made us to imaginate the atmosphere in the Middle Ages easier. After that, both of the troops, they fought with each other. But they could not finish, so they would decide to finish the battle by the "Ningen Shogi" (Human Japanese chess game).